Ask the patient to stick out the tongue. Does the tongue deviate to one side? A hypoglossal, or 12th cranial, nerve palsy does not allow the lingual muscles on the affected side to contract normally. 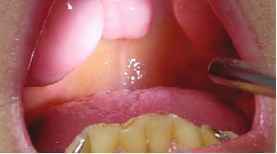 Consequently, the contralateral side ''pushes'' the tongue to the side of the lesion. Figure 12-36 Multiple tori palatini.